Everyone thinks. Everyone continuously makes decisions to act or not act - to believe something or not believe something. Each decision you make results in outcomes, and those outcomes have consequences. The consequences generally include some combination of benefits, risks and costs. The consequences can have an immediate or delayed impact on your life and can range from significant to insignificant. Critical Thinking is a tool or process that will enable you to effectively evaluate benefits, risks and costs then make good, Informed Decisions that will help increase the chance of beneficial consequences while minimizing risks and keeping costs reasonable for the value obtained. Critical Thinking sounds easy in theory - it simply involves careful evaluation and analysis of all factors involved in the informed decision making process, recognizing and minimizing your biases and reaching the most beneficial conclusion for how to act or believe. Critical Thinking can be challenging in practice - it involves careful evaluation and analysis of all factors involved in the informed decision making process, recognizing and minimizing your biases and reaching the most beneficial conclusion for what to believe or how to act. This process includes understanding how our own beliefs, knowledge base, biases and preferences can influence our analysis and decision making process. Critical Thinking is NOT simply accepting what appears to be the easiest or most obvious information available or trusting one's preconceptions or some designated authority when deciding what to believe, what to purchase and/or how to act. ALWAYS assume that anyone who is trying to persuade you to believe in or purchase something will provide information that supports their product claims or beliefs. o That information may be may be true or false, complete or incomplete, and it must be carefully evaluated and analyzed for accuracy. o Those who market legitimate products will provide information that is generally accurate and factual - even though it may be weighted to promote their product. That information can be validated as truthful and accurate by employing Critical Thinking. The purchase of legitimate products benefits both the merchant and the buyer. o A successful scam artist who promotes completely bogus products or beliefs is often extremely proficient at using Critical Thinking skills to refine their cons and enhance their ability to fabricate 'supporting information' in a manner that appears to be truthful and accurate. They can frequently convince the unwary that their inventions and deceptions are legitimate. - As an example, watch some good magicians - they use the same deception skills and persuasive stories to fool the audience, but fortunately they market their illusions as entertainment. How would you like to have this guy use his talents to demonstrate the effectiveness of some 'magic enhanced' water product - do you think he could make you believe it worked? Fortunately, his motives are altruistic - he could be classified as an anti-scam artist. Yet another example of misdirection. You can have a lot of fun watching example after example of talented magicians - these are legitimate purveyors of illusion. Don't try this at home! Other types of legitimate performers and story tellers also frequently dispense fictional information and create imaginative fantasies to entertain their audience and perhaps illustrate important ideas about the human experience - the information, however, is not presented as fact. - Scam artists, on the other hand, market their illusions and fiction as fact. Fortunately, the information used to support the claims of a scam artist can usually be exposed as false by the rigorous employment of Critical Thinking. - The purchase of bogus products benefits only the scam promoter - the customer is left, at best, with a placebo product that makes them feel better and at worst with a drained bank account and a product that leads to physical &/or mental destruction. Benefits of Critical Thinking: Save money - or at least use it wisely; Build self confidence; Develop analytical skills; Learn how to evaluate resources; Figure out reasonable solutions to complex problems; Enhance your knowledge; Reduce your gullibility and avoid scams. 1. Turn the Critical Thinking Process on! 2. Completely & accurately research all available supporting information/evidence without influence of your preconceptions or biases. Question Authority and your beliefs: Don't automatically accept any supporting information/evidence as valid. 3. Understand and carefully assess the consequences (benefits, risks and costs) of any planned decision. Critical thinking is an effective antidote for gullibility. Gullibility is not necessarily related to intelligence (or the lack thereof) - highly intelligent individuals can be convinced by an effective illusion and be so confident their beliefs are correct that they accept the presented supporting 'evidence' as true, fail to rigorously question the 'evidence' and fall for a well executed scam. I have been an active advocate of critical thinking for many years, and I try to practice what I promote. I would have the only ad for a water treatment product in the magazine, and the online representation of the magazine looked very professional - a little heavy on the ads perhaps, but now-days most media is ad-heavy. There was even a section on the company website that described the demographics of the country club residents - it reinforced the belief that they could afford to purchase anything they wanted. So, what does someone who promotes critical thinking do in a situation like this? The sales pitch was very good, the sales representative seemed trustworthy and most helpful, the financial risk was relatively small, the potential benefits for me appeared to be high and the company presented an impressive and credible web presence. The final episode of Cosmos: A Spacetime Odyssey concluded with host Neil deGrasse Tyson describing how science is able to comprehend mysteries of the universe that other ways of knowing reality are unable to fathom. According to Tyson, "Only a few centuries ago, a mere second in cosmic time, we knew nothing of where or when we were. Oblivious to the rest of the cosmos, we inhabited a kind of prison, a tiny universe bounded by a nutshell. How did we escape from the prison? It was the work of generations of searchers who took five simple rules to heart." "Question authority. No idea is true just because someone says so, including me." "Think for yourself. Question yourself. Don't believe anything just because you want to. Believing something doesn't make it so." "Test ideas by the evidence gained from observation and experiment. If a favorite idea fails a well-designed test, it's wrong. Get over it." "Follow the evidence wherever it leads. If you have no evidence, reserve judgment. And perhaps the most important rule of all..."
"Remember: you could be wrong. Even the best scientists have been wrong about some things. Newton, Einstein, and every other great scientist in history -- they all made mistakes. Of course they did. They were human." "Science is a way to keep from fooling ourselves, and each other." You may not be familiar with the expression Critical Thinking, or if you are, your perception of the term might be that it is some dusty, scholarly phrase that has nothing to do with everyday life. There are many definitions of Critical Thinking and many ways of explaining the process. This discussion will focus on Critical Thinking as it can be used to enhance your decision making process. Critical Thinking is a process that will help you avoid making poor, uninformed decisions that are based on biases, prejudices, wishful thinking, lack of accurate information or reliance on untrustworthy, unreliable authorities. Critical Thinking is a tool that will enable you to make good, Informed Decisions based on an accurate interpretation of the situation. Informed decisions are more likely to result in choices that have positive outcomes and consequences for your life than uninformed decisions. I can look back through my life's experiences and review decisions I have made over the years. Many, of course, were made without benefit of critical thinking, and some turned out to have beneficial consequences anyway while others did not. After learning about critical thinking I probably have a better track record of decisions with beneficial outcomes. Honestly, it is not easy to continually monitor my decision-making process and apply the methods of Critical Thinking, and as described in my ad fiasco above, I am not always successful. Critical Thinking is the flame that can help you distill accurate facts from the fiction and illusions presented by scam artists. Critical Thinking must be consciously 'switched on'. It is far too easy to make decisions based on something exciting you hear or read (or an idea that pops into your mind) without effectively following the next two steps. Question Your Own Beliefs and Understanding: Do not automatically assume the information you already have is accurate or complete if it supports your beliefs, biases, preconceptions, prejudices, expectations and current understanding. This is probably the most important and challenging piece of Critical Thinking - "admitting that I might not have a complete, accurate or unbiased position from which to evaluate the available information or make an informed decision". Without that admission, however, I will only seriously question the accuracy of information that conflicts with my current beliefs, biases, etc. - new information that confirms my beliefs, biases, etc. will probably be gratefully accepted as true. Perhaps the second most important piece of Critical Thinking is to question 'trusted sources' (those Authorities you have chosen to believe at some point). Every individual has a different perspective, value system and background through which they interpret the world and make their decisions. Opinions and evidence provided by those you have accepted as "trusted sources" may or may not be best for YOU. Only you can make the best decisions for yourself. It is ok to hear the "trusted source's" opinion, ask further questions and evaluate the answers - along with the other information you are analyzing - it is dangerous to rely exclusively on information provided by any source without careful evaluation. Do not automatically accept as true any new information to which you are exposed from any source. Much of the information provided to 'help us' make decisions comes from others as advice, recommendations or teachings. It is extremely easy to accept this information as accurate by default without serious questioning - particularly if the provider has a perceived reputation as an authority &/or if the information is aligned with our own fundamental beliefs, biases, preconceptions, prejudices, expectations and/or prior knowledge. If a person (as a representative of an organization or acting on their own) provides information they claim is sufficient to make a decision, ALWAYS be skeptical. Always identify the biases, goals, and motives of anyone providing information to you - if they are attempting to obtain a decision from you that will primarily satisfy their biases, goals or motives you can be confident the information will be biased (it may or may not be accurate, but almost certainly it will be biased). For decisions that will have a significant impact on your life, seek additional facts from different sources that represent different, reputable perspectives, including if possible, reasonably unbiased sources that have nothing to gain or lose as a result of your decision. Accept the information and resources that have the best evidence to support its accuracy and validity. Critically Evaluate any New Claims and ALL Supporting Evidence: Carefully evaluate the validity of all new information to which you are exposed and only incorporate accurate information into your knowledge base. Be honest with yourself: if you do not clearly understand the information you are provided or the subject on which you need to make an important decision, invest the time and energy to do the research necessary to gain sufficient understanding to make an informed decision. Rigorously check all claims that are made, and do not depend only on evidence provided by those who support those claims - look for both supporting and non-supporting evidence from other sources who do not have a stake in a specific interpretation of the evidence. Understand and carefully assess the consequences (benefits, risks and costs) of any planned decision and make the decision that has the best value for you. The best value can be defined as consequences that provide the greatest benefits with the fewest risks and costs. It takes a lot of time and effort to research new information. It's much easier to simply believe what you are told or what you read - particularly if it does not conflict with what you already believe and/or it comes from a 'trusted' source. It can be very challenging to actually determine the validity of new information, particularly when it seems to conflict with your belief system. New information that conflicts with your fundamental beliefs, yet after exhaustive research seems to be valid, is very challenging to integrate into your belief system - it's much easier to dismiss the new information as a fluke or an anomaly and not let it disrupt your beliefs. And then, of course, once you are confident that you have valid information on which to base a decision, you must still evaluate the possible consequences of the decision and make a choice of what to do or not do, believe or not believe. The practices and processes of Critical Thinking, like those of science, are amoral - inherently neither moral nor immoral. Consequently, Critical Thinking can be effectively used by the good, the bad, and the ugly. According to criticalthinking.org, "When grounded in selfish motives, [Critical Thinking] is often manifested in the skillful manipulation of ideas in service of one's own, or one's groups', vested interest." You may choose to disregard Critical Thinking when making your decisions. 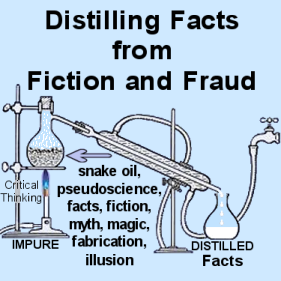 However, you can be certain that the person (or group) that's trying to convince you to hand over your money for any of the countless fraudulent 'opportunities' being promoted (or accept as true some cleverly fabricated belief) is continually using Critical Thinking skills to refine their techniques to more effectively deceive you. Copyright - 2005, Randy Johnson. All rights reserved.